The wrap-on pads are designed with a hook engageable material and stretch band to easily wrap around the affected area. The universal size is ideal for the shoulder, knee and ankle. The wrap-on pads are not available in a sterile configuration. Note: Regular Hose 6.5" , Extended Hose 15"
We cannot guarantee these will work with other cold therapy devices, you would be ordering at your own risk. I got my iceman couple of weeks ago. I followed the instructions and even watched a couple you tube videos before I used it. It worked good the first time and then when I went to use it the second time, I could not get the unit to cool. Went back and made sure i done it correctly. Any solution? I have an iceman and used it for my husband's hip surgery. How do I drain the shoulder pad. It seems to not allow the water to release from the pad. Thank you so much for your help!!!! what does Extended XL-hose mean. Will all the universal cold pads fit a Don Joy cold therapy machine? Is Extended just a large pad and is XL just a longer hose, not a larger hose? I had a knee replacement two weeks ago. The iceman has been fabulous, except the two hose connectors on the pad have become very difficult to snap on and off. I have the universal ice therapy pad . I need to get the straps to hold it in place can I buy these?also can I just use a towel between the shoulder and pad or do I need a dressing? I am having knee replacement surgery in March and a friend has lent me their DonJoy Iceman but they used it for hip replacement. 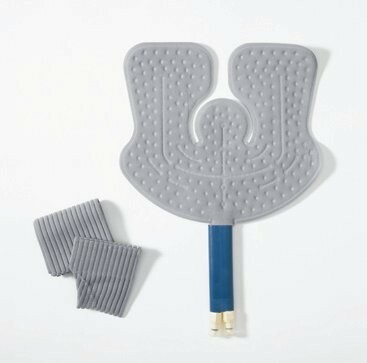 Will the Hip Cold Pad work for the knee also or do I need to buy one specifically for the knee and if so which one should I get? My wife suffers from migraines. Will the universal cold wrap fit well on a person's head? What is the return policy if it doesn't work out? I used to have an airchill for my knee, and it would inflate and deflate, providing pressure on my knee. While I liked that for the knee, I'm not sure if it would be good or bad for headaches. Does this Donjoy unit also do that? Can the ice universal cold wrap be used for replacement hip surgery? Is it large enough? I am getting knee surgery this week and hip replacement in Nov. Seems like the way to go if it works for both. How does one empty the Iceman Wrap-on Cold Therapy Pad? I want to store it, but there's water still in the pad...I see it move. I've tried folding it at the middle crease, hoping the water will pool there, and then I can direct it to the two intake hoses, but it appears to be held in there by something. If I try to store it as it is, the water will become moldy. You must make sure that the pad is connected to the hose of your Iceman unit when trying to get the water out otherwise it has no where to go. Lay the pad on a flat surface and try placing a heavy book on it to push the remaining water out. When you decide to use the unit again first run warm water and a 10% bleach solution to break up any mold that has built up in the hose and pad. I have the Iceman by Donjoy universal cold wrap and the ice machine. I used it last year and stored it for the year. I brought it out this week and it smells of mold tremendously. How can I clean the mold out of the machine and the cold pad? I did rinse it with a mixture of 1cup bleach to approx 1.5 gals of water, but that didn't help. Can you tell me how the hand/wrist wrap works & how much it is? I also have misplaced my plug. Can you tell me how much a replacement one is. If I order them tomorrow (Mar 17) abt when can I expect to get them? Thanks so much! I love my Iceman Clear!! Best therapy around!! The water bag has torn where the inlet and outlet parts fit into the long hose. I will be having another knee surgery. Can I get the bag part? Is it reliable to replace the bag or buy a new system? This is third knee surgery coming up soon. Yes we have replacement parts for your IceMan. We can replace your Knee Cuff, Shoulder Cuff, etc. Please call us at 1-888-405-3251. I purchased a Don Joy machine at a garage sale. The connectors from the icepack tp the machine are cracked. How do I replace the broken screw off connectors. I appreciate your help with the replacement parts. Are you talking about where the hose attaches to the cooler? If so, we do not off replacement parts for that particular piece. Are there instructions or even better a illustration on how to put on the universal cold threapy wrap on a shoulder using the provided straps? We took it off and now cant figure out how to put it back on corrrectly. The product really helped but I cant seem to find any illustrations oh the correct way to wear it on the shoulder. With the universal pad you are going to apply it so that the hoses coming out of the pad are going up towards the head and the circle in the middle of the pad will be over the shoulder joint area and the rest of the pad will wrap down on the arm. Unfortunately we do not have any other illustrations, than the ones that come with the unit. What is the best way to clean and store the Iceman and the cold pad?? Rinse out the cooler with warm water and a mild soap. Wipe the outside of the pad down with a warm rag. Store in a cool dry place. Good Product but need an insulator cloth around the side that the instructions say NOT TO LET COME IN CONTACT WITH THE SKIN over the area being treated. It really does the job of lowering the temp on my newly installed replacement knee. But...it needs to have a soft cloth on the side that gets really cold. otherwise you have put one on that area. It gets very difficult to do that by yourself because you have hold the cold pac, hold the temp reducer cloth and then wrap the velcro pieces around the whole thing. Luck I had my wife to help me. The entire Iceman system along with the accessories were a Godsend after my knee replacement surgery. There were days when my knees were just throbing and knowing that I would be able to use the Iceman product was such a relief. I know that I wouldn't be this far advanced in my recovery if it weren't for the Iceman products and accessories. Pros: Excellent concentration of relief where you need it due to the unique contouring of the icing pads and Velcro support straps. Used this on my ankle and it worked great. If I didn't have this, it would have been pretty difficult to ice my ankle. Thank you for the great product. Used as directed, I had no problem with ice burning my skin or any other problems. It worked fantastic!! We have an old EB Ice unit and could not find parts. This worked perfectly. Bought this to replace an old bladder for prior surgeries (4) this year! Used to help relieve pain after second shoulder replacement. It is a life saver whenever I need it. Used for other aches and pain, too. Pros: Easy to assemble, the elastic straps are great to stabilize and hold the bladder in place. Use on other parts of the body since it is flexible to the knee, elbow or shoulder. Cons: Plastic connectors do not last long, and become brittle and breaks after a while. This is what happened with my first bladder. Had an accident which caused a torn rotator cuff and torn labrum in my shoulder. Doctor had me use device after surgery. It was simple and fast to set up and use. Made a huge difference with pain and mobility. It's very effective and area specific. I highly recommend it! Pros: Very easy to set up and use. Very effective. Pad was area specific and fit well. Saves a lot of time. No constantly freezing ice packs. I had a total knee replacement. Pros: Comfortable, easy to use. The DonJoy ice machine is great. I had used it for my ACL surgery before. This time, I needed it for a total knee, but the pad wore out and I needed a new one. Would recommend it highly.